Canada’s wind energy industry further expanded its installed capacity in 2018, while solidifying its status as the lowest-cost source of new electricity generation. Newly commissioned projects brought total national wind energy capacity to close to 13,000 megawatts (MW). Meanwhile, competitive auction results in Saskatchewan and Alberta confirmed the wind industry’s ability to continue to deliver record-low prices. The six wind energy projects that were powered up in 2018 added 566 MW of installed capacity – a continuation of steady growth that contributed to an average annual growth rate of 20 per cent per year since 2008. Two new projects are located in each of New Brunswick, Quebec and Ontario, and two of the six have both community and First Nations ownership stakes. Quebec accounts for about two-thirds of newly installed capacity in 2018. Both Saskatchewan and Alberta contracted for significant additional new wind energy capacity in 2018 at an average bid price of $42 and $39 per megawatt-hour, respectively, which is comparable to the record low average bid price of $37 recorded in Alberta in late 2017. Wind energy figures prominently in these provinces’ progressive strategies to increase renewable generation. Downward wind energy price trends were confirmed by a 2018 U.S. analysis (Lazard 12.0) which found a further seven per cent year-over-year decline, and a 69 per cent decline since 2009. Total installed wind energy capacity in Canada is now 12,816 MW, enough to meet the needs of approximately 3.3 million homes. Wind energy production meets approximately 6 per cent of Canada’s electricity demand – and more than that in jurisdictions such as P.E.I. (28 per cent), Nova Scotia (12 per cent), Ontario (8 per cent), Alberta (7 per cent), and New Brunswick (7 per cent). In its most recent business-as-usual energy supply and demand projection, the National Energy Board indicates wind energy is forecast to add approximately 510 MW of capacity annually going forward, accounting for 27 per cent of the new electricity generation Canada will need between 2017 and 2040. The industry has a clear ability to outperform this outlook however, given annual capacity increases of closer to 1,000 MW on average over the last decade, and wind energy’s low cost and non-greenhouse gas emitting attributes. For 2019, CanWEA expects to see approximately 1,000 MW of new wind energy projects commissioned, including the projects contracted under Alberta’s first renewable energy procurement and projects currently under construction in Ontario, as well as the Western Lily wind farm that came on line in southeast Saskatchewan this month. National installed capacity has doubled since 2012. The six new wind energy projects that went into operation in 2018 represent an estimated total investment of $1 billion. In total 299 wind farms, comprised of 6,596 turbines, are now operating across Canada. There is installed wind energy capacity in all Canadian jurisdictions except Nunavut, with the large bulk of it currently located in the provinces of Ontario (5,076 MW or 40 per cent), Quebec (3,882 MW or 30 per cent) and Alberta (1,483 MW or 12 per cent). Canada is the 9th largest wind energy producer in the world. Saskatchewan contracted for an additional 200 MW of wind energy capacity in October 2018. The weighted average interconnected bid price from all competitors was $42 per megawatt-hour, and the winning bid came in below $35 per megawatt hour, making it closely comparable to a record-low weighted average bid price of $37 price for the winners in a 2017 Alberta auction. Saskatchewan is targeting a 10-fold increase in its wind generating fleet in 12 years. 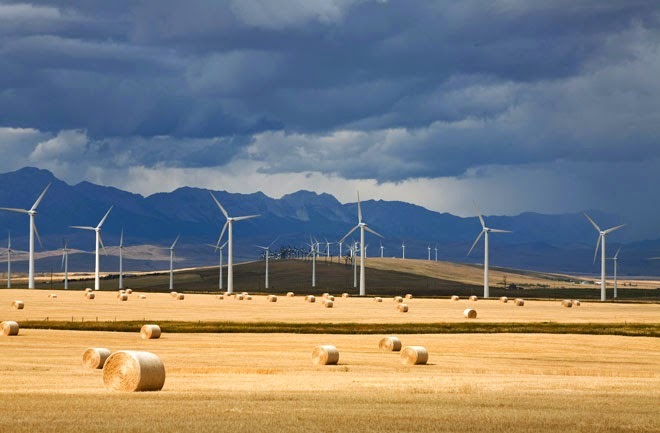 Alberta contracted for an additional 763 MW of wind energy capacity in December 2018, at a weighted average price of $39 per megawatt-hour. The contracts awarded through one of the two procurement rounds involved all met a 25 per cent Indigenous equity partnership threshold. Opinion polling confirms strong public support for these provinces’ emergence as leading wind energy centres. Six in 10 Albertans support provincial efforts to facilitate wind energy development, with fewer than two in 10 opposed. In Saskatchewan supporters represent more than eight in ten people. Economic analysis in Ontario in October – updated to reflect the current procurement outlook – confirmed the significant scope of economic benefits associated with the wind energy already installed or that remains under development in that province. In 2006-2030, $12.5 billion in wind energy investment is expected to create (directly and indirectly) 64,500 person years of employment, and add $6.2 billion to provincial GDP. 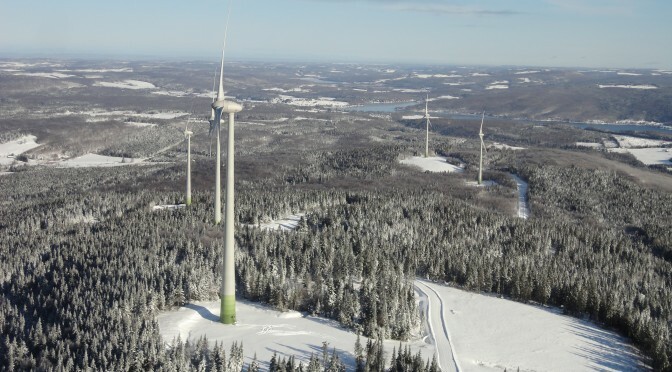 The 65-turbine, 224.25 MW Nicolas-Riou Wind Project in Quebec was the largest of the new wind farms brought online in 2018 and is among the five largest in operation in Canada. The November 2018 Levelized Cost of Energy Analysis by Lazard (12.0) determined that in the U.S., the mid-point of the cost range for unsubsidized wind energy (US$42) is lower than any alternative, with natural gas combined cycle generation coming in cheapest among conventional options with a cost range mid-point of US$58. CanWEA is the voice of Canada’s wind energy industry, actively promoting the responsible and sustainable growth of wind energy. A national non-profit association, CanWEA serves as Canada’s leading source of credible information about wind energy and its social, economic and environmental benefits.